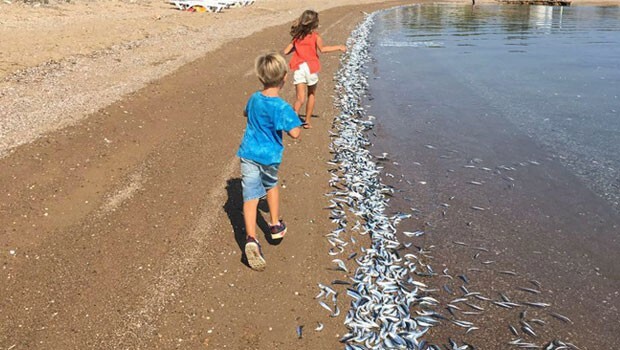 Hundreds of thousands of dead fish washed ashore in the Tarsus district of the southern Mersin province on Sept. 19, reportedly due to contamination from a malfunctioning wastewater treatment plant in neighboring Adana. Officials have warned residents not to consume or touch the fish. "The scene that you see here is heartbreaking. It breaks the hearts of Mersin and Tarsus residents. Millions of dead mullets have filled the beach and when we ask about the issue to the villagers nearby, they say that it's been going on for four months now," Mersin lawmaker Aytug Atici said as he visited the area, according to Dogan News Agency. "We won't stop pursuing these incidents and will prevent fish deaths. We know that the people of Mersin and Tarsus are with us in this struggle. We are calling on them to support us," he said. 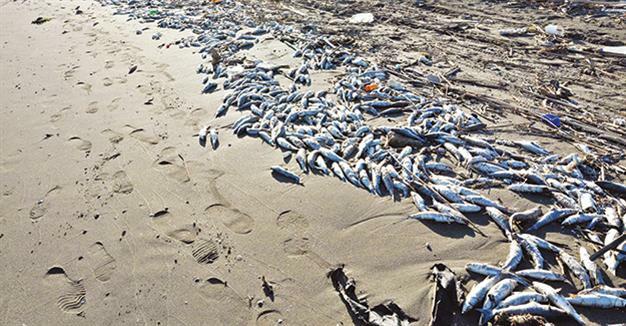 Saying there were reports of fish dying due to a wastewater treatment plant in the neighboring province of Adana, Atici called on officials to investigate the aforementioned claims. "Nature-friendly people and environmentalists concerned with the issue say that a wastewater treatment plant in Adana isn't functioning properly and that that is the cause of the fish deaths. This is an extremely grave allegation. Actually, it's beyond an allegation; it has become a finding because the environmentalists here forced official institutions to analyze the water with their own money, and the results said the water released from the plant in Adana was contaminated," he added. During his visit to the beach, Atici said that in addition to the fish dying, the contamination was having negative effects on the health of humans and animals living in the sea. "We examined the results of the analysis one by one and we were convinced that this is a situation that can be prevented. It is thought some of the sardines may have been thrown away by fishing trawlers?